Jinju endures piercing pain to turn into an honorable jewel that symbolizes the prestige of a man. It is made in the most traditional way with local rice milled on the same day. It is produced with 21-year old doraji whose temperature is closely kept under control in a three-layered tank. 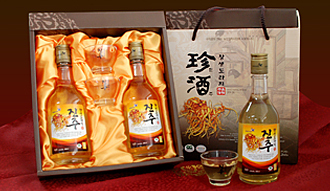 The scent of Doraji melted in a transparent gold delivers the deep taste of high-quality traditional wine. 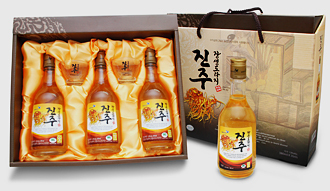 The density of ethyl alcohol, which is the major alcoholic substance, is 13% in Jinju and 16% in Jinju premium. The content of solid substance is 10% in Jinju and 11% in Jinju Premium. The pH level is the same at 3.9–4.0, and both show a unique color, well-balanced taste and scent. Wine color is based on flavin chemicals, such as riboflavin and flavin mononucleotide, which is created during fermentation. Riboflavin is another name for vitamin B2, which supports the activation of enzyme-oxidizing carbohydrate, protein, and fat. It promotes growth and resists skin infection. Five flavors are created by the following elements. The elements of scent are ester and organic acid by acid and high-quality alcohol. The carbonyl compound, which is a composite of enzymes, amine, sulfuric compound, and water, are mixed up to create a unique scent.